For recent visitors to Britain's largest music festival the experience can be summed up in a word. Mud. But this year's Glastonbury festival is preparing for a scenario of blue skies and scorching sun. For the first time since 2003 organisers are "quietly confident" about sunshine in Somerset during next month's festival, and contingency plans are being put in place, with hosepipes, ice sellers, suncream and even dermatologists at the ready. To avert dust a fleet of bowser tanks will, if needed, roam the site and pump 2m gallons of water on to the fields every hour. Last year drainage pipes and gravel were laid in the runup to the festival in an ultimately vain attempt to prevent a quagmire. This year Michael Eavis, 72-year-old founder of the festival, has been quoting the rhyme "oak before the ash, then we'll only have a splash" - an abundance of green oak leaves being apparently a decent assurance of good weather, despite this week's bank holiday deluge in the south of England. His sunny predictions could also be an attempt to lure more people to this year's event which, unusually, has still not sold out. Critics have blamed lagging ticket sales on the inclusion of hip hop artist Jay-Z in the list of headliners. 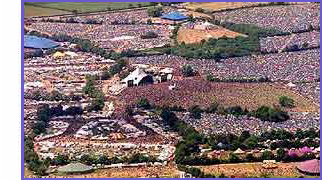 Another theory is that large-scale "mega-festivals" - of which Glastonbury is the biggest - have become less popular. But many festivalgoers simply say that the energy-sapping mud of recent events is the main deterrent. A spokesman for the Met Office said rainfall was "more likely to be either near, or above average" for the time of year. Heard this the other day, fingers crossed that it all pans out!